We make the tools that connect people. That makes us an essential part of any forward-thinking business. For you, it means a tech-enabled sales career with products that businesses want and need. It means being empowered to shape your career and your future. To put yourself in the driving seat. We are trusted advisors to our clients. And operating in a highly competitive sector, our salespeople put in the effort, and the hours. It takes patience, flexibility and an open-minded approach to changing customer needs. It takes grit. And when you show that commitment, we feel it’s only fair to repay you with fantastic rewards, training and support. The latest tech – we believe to sell our systems, it’s only right that you are fully tech-enabled. 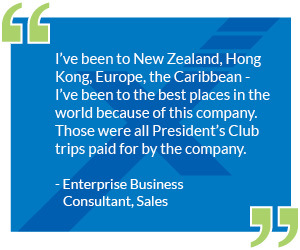 President’s Club – we offer fantastic reward trips to team members who hit the right numbers. These are five-star trips and previous destinations have included Fiji, New Zealand, Copenhagen and Hong Kong. A sales career at TPx is all about helping customers with increased productivity and collaboration. These are real differentiators that drive sales and we are here to help ensure you have every opportunity to make and close deals.